Royal Blood performed their current US single, “I Only Lie When I Love You”, on TBS’ late night series Conan on December 7, and video from the program is streaming online. The song is the second track issued from the sophomore effort, “How Did We Get So Dark?”, which debuted atop the UK charts upon its release in June to duplicate the success of the band’s 2014 self-titled record, the fastest-selling British rock debut album in their native country in three years. 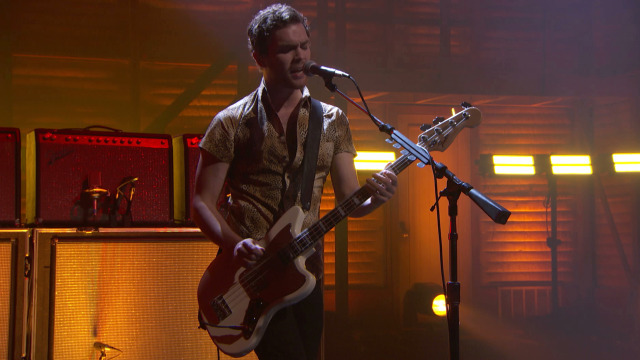 The duo of bassist/singer Mike Kerr and drummer Ben Thatcher received the chart-topping news just prior to taking to the Pyramid Stage at the Glastonbury festival on June 23. The duo later stopped their hour-long performance at the UK event to share the achievement with fans and to toast the crowd with champagne.